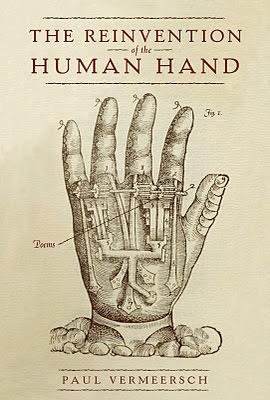 Jacob McArthur Mooney: The Reinvention of the Human Hand reads, in many parts, like the author is feeling out a human territory inside the animal world, trying to identify the parts of us that are ancient and imperative versus those that are cosmetic and fleeting. Obviously, this is a poetic concern with a lot of history and varied degrees of what we might dismissively call anthropocentric attitudes, from the animal-as-human metaphors of a Ted Hughes to the increasingly ethereal nature-speak of Canadian poets like Tim Lilburn or Robert Bringhurst or Roo Borson. There’s an attempt in this book, I think, to find a third way, a kind of rapprochement between the two. Where do you see yourself in this tradition? Paul Vermeersch: It’s interesting that you should mention Hughes. I feel that I’m coming at the topic of the human/animal in a very different way than Hughes did. I’m more interested in the human-as-animal than the other way around. I think that’s an important distinction. Intellectually, I guess I wanted a kind of post-humanist approach to primitivism. But creatively, I didn’t want to set out to arrive at a predetermined conclusion with the poems in this book, so “feeling out” is a good way of putting it. I don’t like writing poems that exist merely to illustrate a theory. Like animals, poems have their own life; that is an idea I share with Hughes. So I wanted the book to evolve, in a manner of speaking, rather than force myself to write poems to fill pre-existing niches. In the end, I explored several poetic approaches to a few different ideas I have about the human/animal divide, and then I put them next to one another to see how they behaved. I'm really enjoying it, so I have to recommend Tony Hoagland's new book Unincorporated Persons in the Late Honda Dynasty. 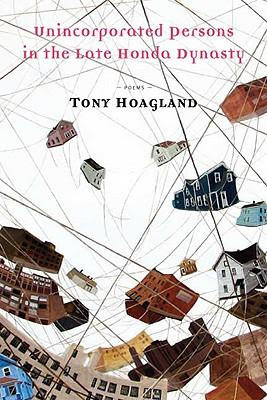 As Dwight Garner points out in the New York Times, Hoagland "writes in an alert, caffeinated, lightly accented free verse" which at first glance might seem frivolous and rudimentary, but it would be high foolishness to accuse these poems of lacking the poetic rigor of more stringently blueprinted fare. Deep down, Hoagland's poems address the growing malaise of our times, of a civilization drowning in its own disposableness. The voice of these poems isn't so much desperate for an authentic, emotional experience; it's more like the voice of someone who was once desperate for an authentic, emotional experience, but who has now given up the search, more-or-less, but is still open to the possibility. He holds a mirror up to our complacency and laziness and suburban comforts, and it should almost horrify us, except that it's so damn funny. So potent is Hoagland's anti-tonic for the cushy, slovenliness of Western life, The New York times felt inclined to review the book twice, once by Dwight Garner (mentioned above), and again by Joel Brouwer, who said, "Hoagland rejects both the cynic’s lie that everything superficially beautiful must be rotten underneath, and the romantic’s lie that everything apparently ugly must possess some essential nobility." Which is not to say that there is neither cynicism nor romanticism in Hoagland's poetry. I think there is plenty of both. Like chocolate and chili, Hoagland combines the two flavours into something powerful. Lucia Perillo in conversation: "We killed coyotes; we killed birds. I killed lots of things." Here is Lucia Perillo in conversation with Maria McLeod at the Poetry Foundation Website. As readers of this blog may know, Perillo is one of my favourite contemporary poets. If you haven't read her yet, you should. And her latest book Inseminating the Elephant is a good place to start. Perhaps this interview will convince you. In this interview Perillo discusses her "origins" as a poet and the shift in her outward identity that came with a diagnosis of MS. I have never really thought of Perillo as a "disabled poet" or as a "poet of disability" even though her subject matter often covers that ground. Mostly, I think of her as a kind of nature poet (in the broadest possible sense -- she is a trained biologist, and as a poet she is remarkably attuned to the physical universe), and as a poet of the borderlands between the body and the mind. I have two new poems in the latest issue of the fabulous on-line magazine Forget. These poems are even newer than my as yet unreleased new book. They are so new, they are from the future. Check them out! Happy ninth anniversary to Forget Magazine, and happy Valentines Day! Well, I haven't updated the blog in over a month, so I thought I should check in and account for my absence. I have been busy! Exciting things are happening, and I will be back to write about them as they unfold. A few days ago I received the advanced copy of my new poetry collection The Reinvention of the Human Hand from McClelland & Stewart, and I have to say I am very happy with how the book has turned out. Andrew Roberts did a marvellous job with the design, and this is certainly my best looking book to date. As with my last book, I got to work with A.F. Moritz as my editor. We all know he's one of the best poets in the English language, but as an editor he's an absolute joy to work with; he's so astute and generous... simply top notch. He really helped me whip the manuscript into book-shape. The book's official retail release date is March 17, and plans for a launch party in Toronto are in the works (date and venue TBA). In other news, I am still busy with my studies. I am enrolled in the MFA progran in creative writing with the University of Guelph. Right now, I am wandering through the forbidden forest of fiction writing, and with the help of Michael Winter, I might just find my way. Writing fiction feels strange to me in many ways after working solely in poetry for so long, but with some help, I'm sure I'll learn a few tricks and put a few more tools in my toolbox. Also, coming up in March, I will be the Writer in Residence for Open Book Toronto. Stay tuned for more information.